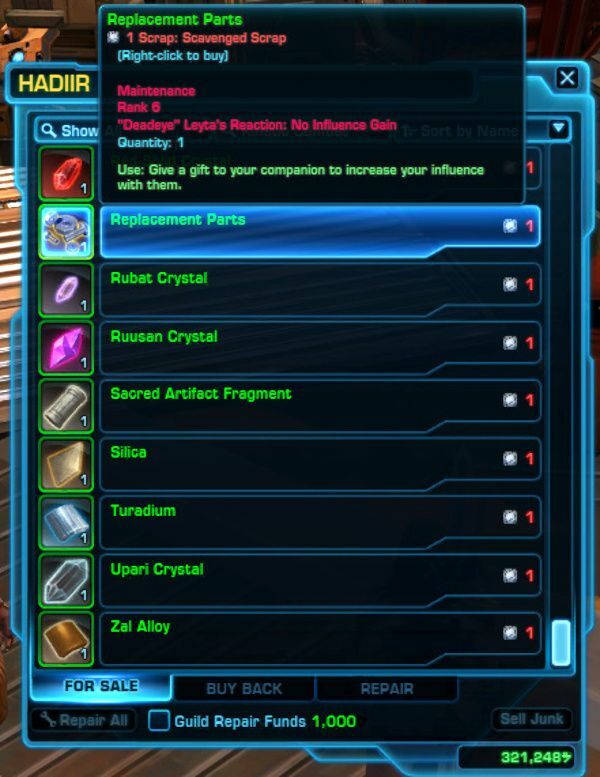 SWTOR Companion Influence - How Do I Increase It and Why Should I? 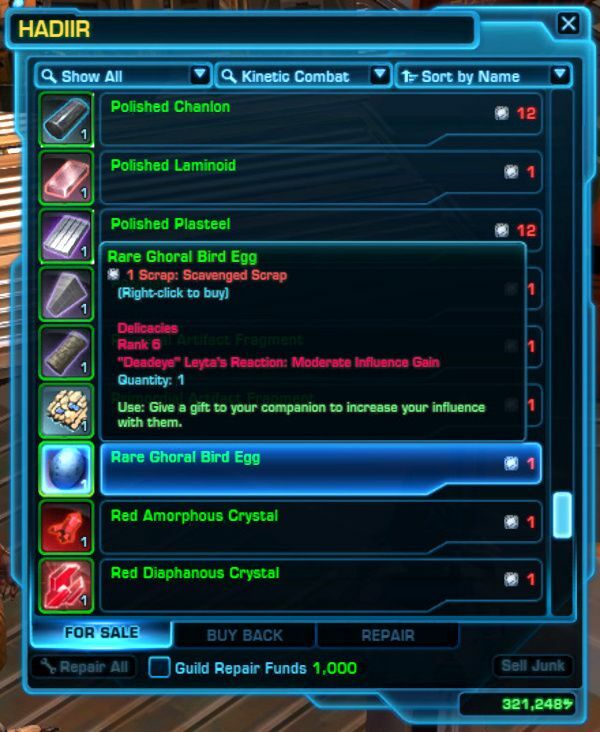 Welcome to my first SWTOR Guide in a very long time! This is the first, in what I hope to be, a long series of guides aimed at beginners or new players of Star Wars: The Old Republic. This one covers SWTOR Companion Influence. Companions join your own character from the first planet of your class story. That means the issues of your impact on them arise straight away for new players and characters. I’ll be answering questions around why it matters to you as you play the game. The vast majority of this guide however will help you find out how to improve your companion’s influence – and there are a lot of ways! If you have any questions, feel free to post in the comments or speak to me on Twitter. Let’s get started, shall we? Here’s a collapsed menu showing the sections of this guide. Use it to read the bits you’re really interested in! Which Gifts For Which Companions? Where Can I Get Companion Gifts From? 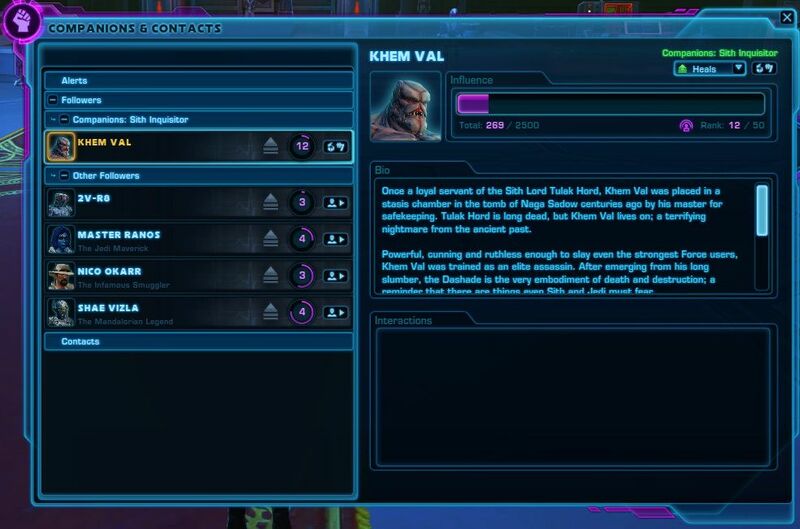 SWTOR Companion Influence (previously Affection) is a gauge as to how much characters in your ‘Companions and Contacts’ panel (default shortcut: N key) like you, or at least, approve of you and your actions. When it used to known as Affection it was actually possible to have them dislike you – i.e. a negative ‘affection’ rating. This is no longer the case. How much sway you hold with your NPC friends and contacts, is measured from ‘level’ 0 to 50, with each level requiring more work than the previous one. There are two places you can find the current rating of your friends and allies. You can find the complete list of companions and contacts in the – wait for it – Companions and Contacts Panel (*sharp intake of breath*)! From this panel you can also summon a companion, which switches your current active one, with the new one, as well as read a short synopsis of that character. It may also contain some key points in your history of interactions with them. Your crafting panel (SHORT CUT KEY) also displays your companions – but not in ‘groups’. Instead, they are listed from those with the highest influence rating, to the lowest. I’ll come onto why that matters a bit later. Or you can go there now if you want! Why Does Companion Influence Matter? 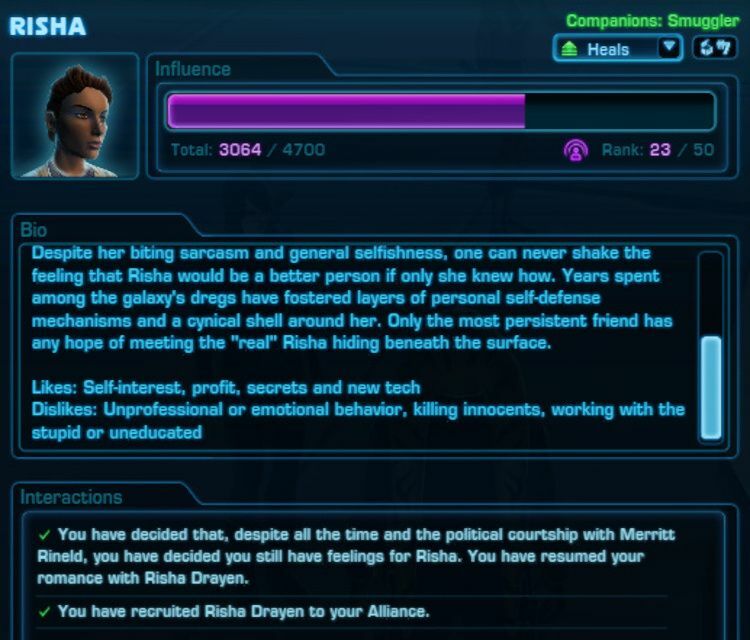 How strongly a companion approves of you has a number of effects for your own character as you play SWTOR. But it is worth pointing out that if you don’t fight alongside, or craft with, a certain companion then you need not get overly concerned with how much clout you have with that companion. The first effect of higher influence is on how well they perform in combat when fighting alongside you. That means the higher their rating, the better job they’ll do as Tank, DPS or Heals. A couple of other players (including, thanks to @rebelrealcanon) also pointed out that companions get better at “Combat Role Adoption“. At higher levels, companions can ‘multitask’. i.e. a Tank companion can throw heals, a healer companion can deal more damage when not healing. This makes your job as the playable character easier; If you’re a DPS with a healing companion, if they heal your faster/better they can deal damage you do not have to; if you’re a Healer and your companion is DPS, at higher levels, they may be able to heal themselves a bit, freeing you up to deal some damage. Once you reach Knights of the Fallen Empire you may find you need to increase influence with a number of NPCs who you would normally disregard. This is because certain chapters and Flashpoints (e.g. Traitor Among the Chiss) force you, on your first Story run, to fight with people who are key to the story’s development. Even some characters who were part of a different class: Kaliyo, Torian Cadera, Vette etc. That said, I think the difficulty balance in those chapters would also have taken into account the likelihood of a zero-influence rating. At least those where your first interaction is within a chapter or Flashpoint. But you could still take a few gifts with you into those chapters to ease the pain a little. The less time they spend crafting and on crew skills missions. The higher their Critical Rating for actual crafting (making a better quality item, or more items, depending on the schematic). I believe this also increases the critical rating for crew skills missions (chances of them to return with better items, or more items). Remember, SWTOR is an RPG. Therefore it may make sense for your character to be closer to some companions and not others. i.e. a life partner may be the highest influence, followed by your most trusted advisor. It may also determine which companions or contacts you do not get along with. It’s not always about crafting or combat performance – choosing your character’s story and personal connections also matters in a role-playing game! How Much Influence Do You Need? If you’re a beginner to SWTOR, or have just started a new character then I would advise not being too anxious about this – especially where combat is concerned. When the vanilla planets were released (everything from your starter planet to Corellia) and maybe even up to the events of Shadow of Revan, the maximum (as it was then) affection used to be a rating of 10. So for your class story and open-world content you do not need a high rating at all – though it can still be helpful. And if crafting matters to you, then that may be your main incentive to bump the rating up a bit. However in tougher content – Heroics and Flashpoints – you may need to improve it somewhat. Although, again, the first flashpoint you encounter – The Black Talon and The Esseles (in Story Mode) were designed to be run with your first companion right after the starter planet, so high influence was not expected. Now we understand why having greater sway over your NPC friends is important, let’s turn our attention on ways you can increase that rating. The cheapest way to encourage your allies to approve of your more is through how you interact with them in conversations. This also applies to the decisions you make while they are your active companion. During the events of Knights of the Fallen Empire (and KotET) you can influence multiple companions by your conversations and decisions if they’re in the room, or on the Holo during the interactions. If, by the way you talk to the character, you have a positive impact on them, then you will gain a fairly large improvement in Influence. In a lot of cases, if they disagree with you or disapprove of a decision you have taken, you will gain a very small improvement. If you’re new to SWTOR then the only companions that really matter are those that join your crew as part of your class story. These ‘original’ companions have a list (or at least a description) of what they like and dislike. It is helpful to read these carefully as some companions are not obvious. e.g. 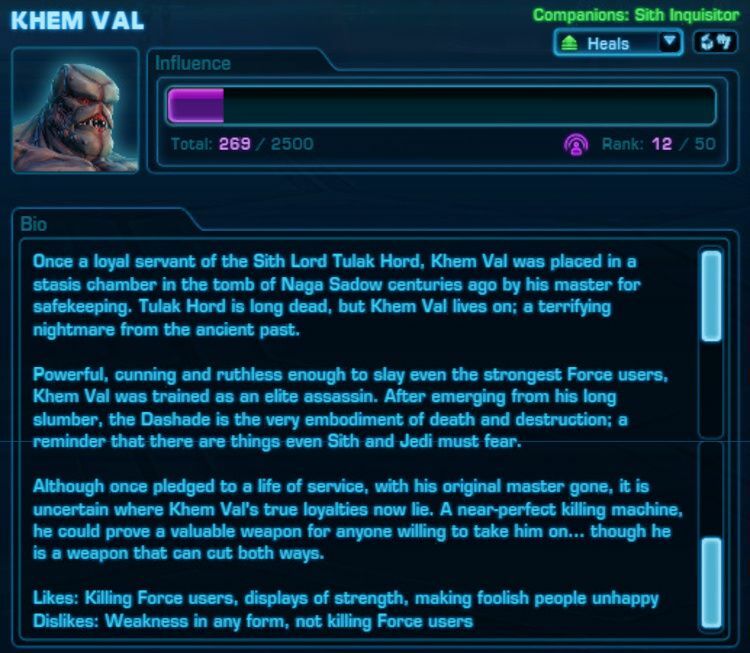 Sith Inquisitor companion Khem Val may approve of you killing Sith, even if doing so could be considered ‘Light Side’. Jedi Consular companion Nadia Grell may approve of a Dark Side choice if you’re protecting family or friends. NB: Agent Companion Dossiers are less obviously highlighted. So you’ll have to use your brain for those ones. Sorry! It should also be noted that other (even before KotFE) flashpoints may also score some points with companions. It’s simply that The Black Talon and The Esseles has a higher level of interaction. There is no influence to be gained in Shadow of Revan through conversations, neither with class companions nor Theron Shan or Lana Beniko. You have to wait for KotFE onwards for that. Class companions returned during KotFE/KotET will not gain improvements from conversations on the vanilla planets. This includes Ilum and Makeb if you do these story Arcs after the events of KotFE/KotET. 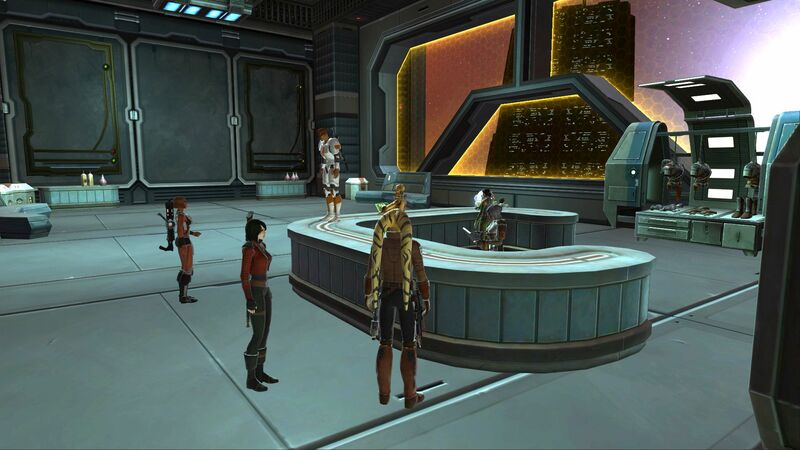 NOTE: if you retrieve your lost companion via the Holo-terminal on Odessen before encountering them in missions and Alliance Alerts, then you can go back and gain extra points from earlier content. Sending your companion out on a Crew Skills mission also increases their rating. The higher level the Mission, the more influence can be gained. Note that actual crafting (making stuff) does not increase the rating. Companion influence can often be swayed by giving them lavish gifts. Note: different companions prefer different gifts. Except at very low levels, it is not worth giving gifts that yield anything other than a Large increase. Although there are several grades of ‘gift quality’ the amount your companions likes you each time you give them the same gift decreases as your influence with them increases. Your first book about the “true Sith” may increase your sway over Lana Beniko by 1500 points (estimate). But once she’s received a library’s worth of duplicate copies, it has less of an impact. Not surprising! For this I will simply point you to the excellent Guide on Dulfy rather than try to explain this myself. No point duplicating stuff that others in the community have covered so well. Given that there are, even for class companions, a finite number of conversations you can have with your companion around, where can you get gifts from? Defeating enemies do yield some gifts, and sometimes the chests you find around the open worlds contain them too. Some Crew Skills Missions also grant companion gifts. 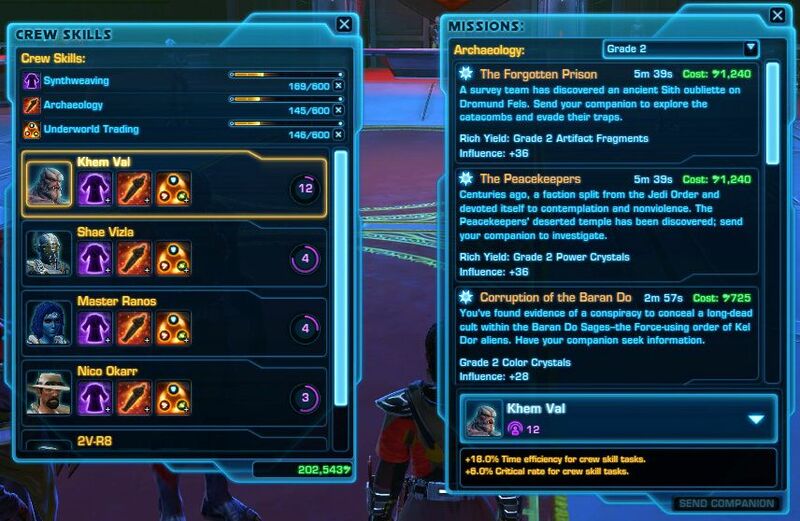 These are the mission-types that aren’t ‘gathering’ missions for materials you find in nodes while questing. i.e. Diplomacy and Treasure-Hunting, not Archaeology an Scavenging. 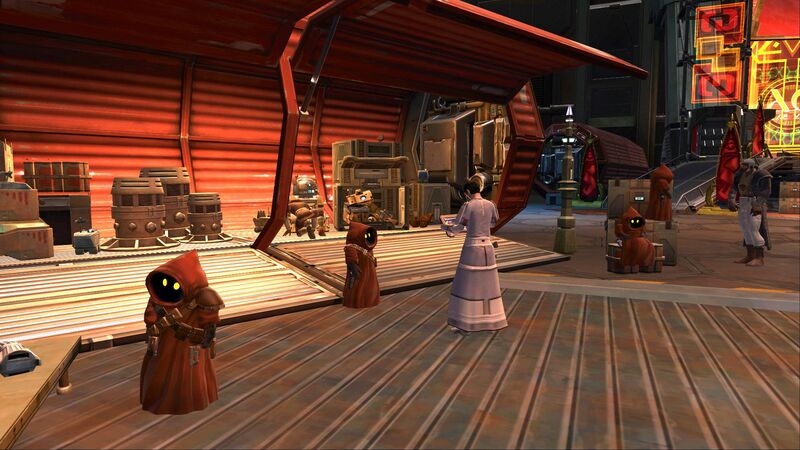 Republic and Imperial Fleets both have companion gifts vendors. See the screenshot below. 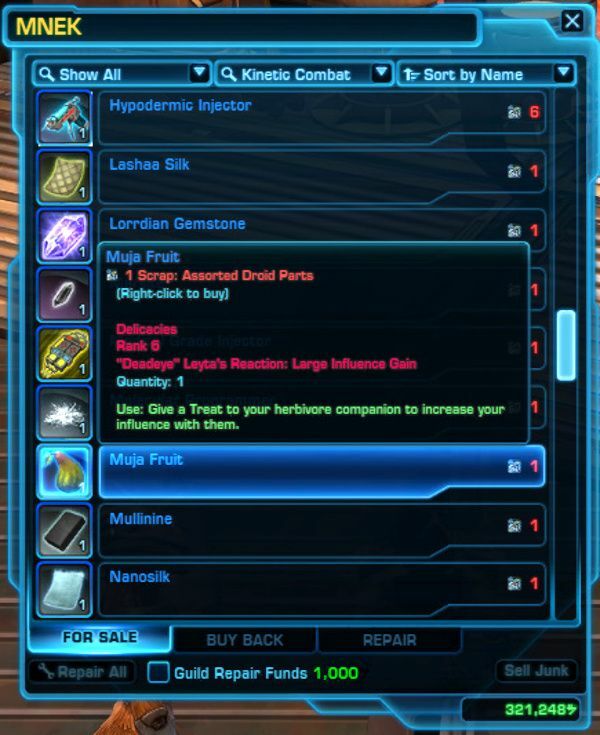 I believe Coruscant and Dromund Kaas both have a basic gifts vendor too. Once you reach Level 60, Heroic Missions grant Alliance Crates. 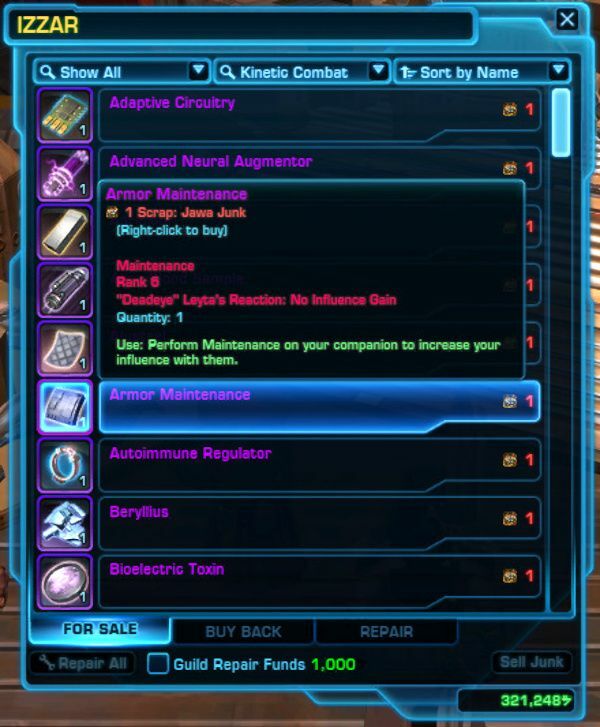 Upon reaching Odessen after Chapter 9 of KotFE, you can turn these in to your Alliance Specialists. As well as cosmetic armour, they often contain companion gifts of varying quality. If you are subscriber, once you reach Level 70, instead of a ‘normal’ levelling system, you begin to earn ‘Command Ranks’. With every mob you defeat and mission you complete, you will be awarded a varying amount of Command XP. 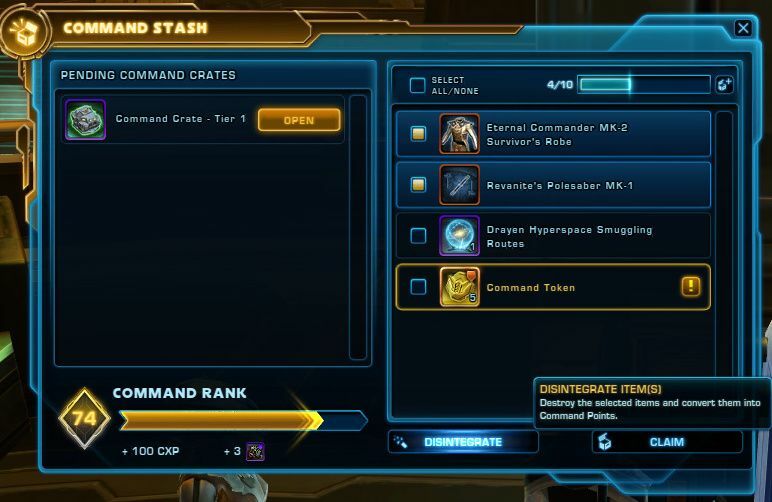 Whenever you ‘level up’ a command rank you are granted a command crate. Opening these will often yield a companion gift. 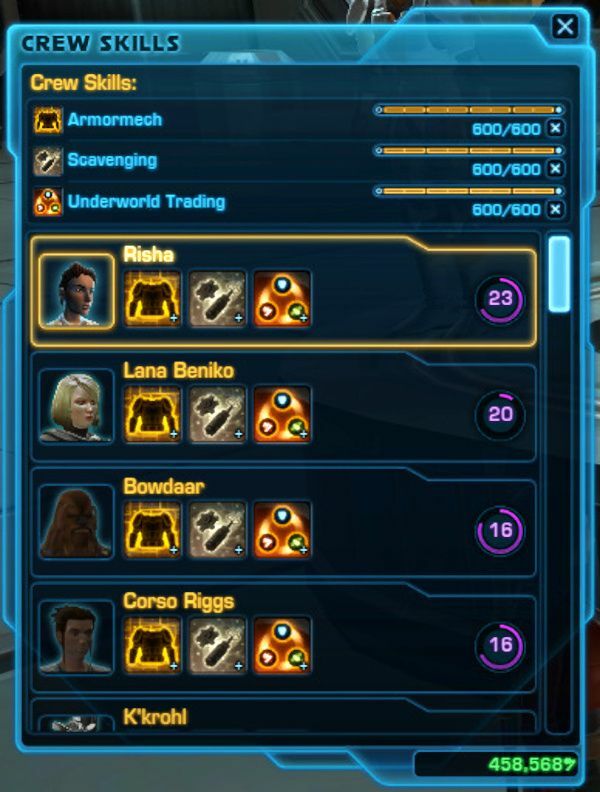 On Republic and Imperial Fleet, in the Cartel Bazaar there are three Jawa eager to trade junk for stuff you might actually want. One use of Jawa Junk. Aside from GTN (Galactic Trade Network) the Jawa Junk vendors are the main place to obtain gifts for Creature and Droid Companions. Depending on the grade (denoted by the colour) of the junk, you can trade it for Premium, Prototype or Artifact Gifts. Examples below. Where Can I Get Jawa Junk From? Command Crates will sometimes yield them. 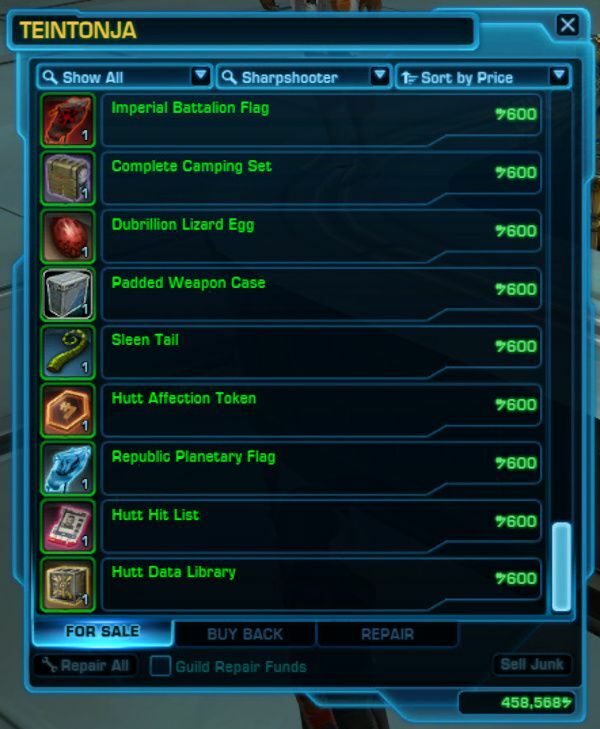 Unless something has changed, then purchasing Packs from the Cartel Market has a chance of dropping Jawa Junk too. In your legacy panel, there are a few options that help you increase the points gained by various actions. They do require a bunch of credits up-front, however. But if you want to be highly influential with certain companions, then having these options on will both speed up that increase and save you credits on gifts too. 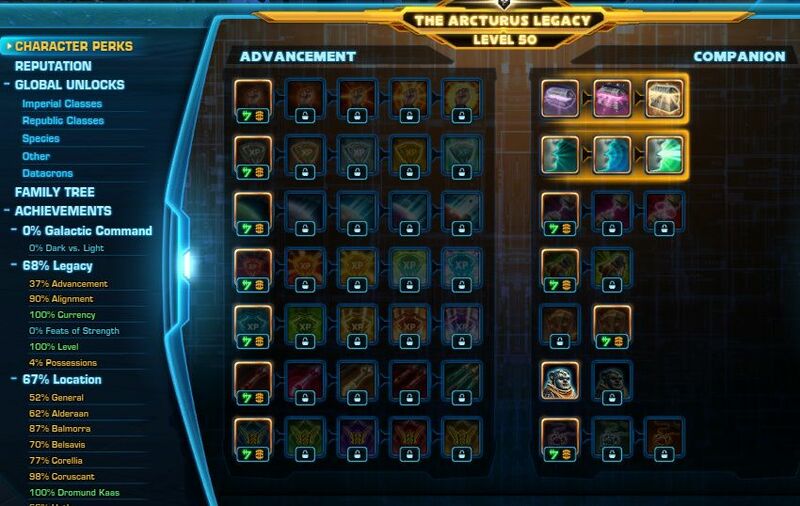 If you’re a new player, the prices for these Legacy Perks may seem steep. However, the more you level, the more credits you earn per mission turn-in. And trash/scrap items are worth more the higher your level too. Unlocking the Legacy of Altruism increases the amount of influence gained from giving companion gifts. 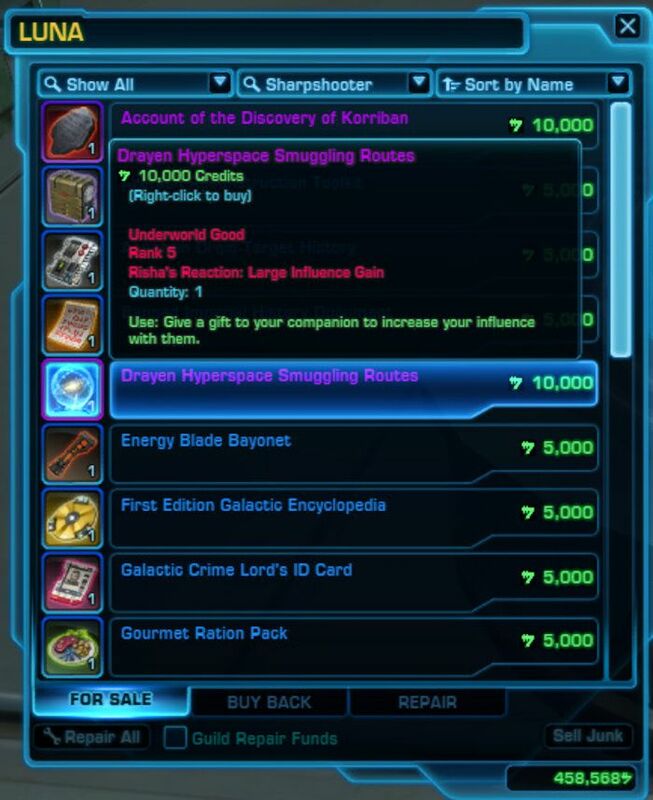 This is mentioned in my guide to Saving Credits in SWTOR. Unlocking the Legacy of Persuasion increases the amount of influence gained from conversations (including choices made when companions are active and/or in the cutscene with your character). Thanks to @celyntheraven for pointing this out, but unlocking the perks in Legacy only affects the character you unlock it with and not your whole legacy. So you’ll need to pay the credits per character if you want these increases. Companion influence is the main way to improve how well they fight with you and craft for you. But you can also use the rating system when writing your ‘head canon’ for your characters too. You can improve your standing with your allies and NPC friends through conversations, crew skills and by showering them (or more likely, drowning them!) with gifts. 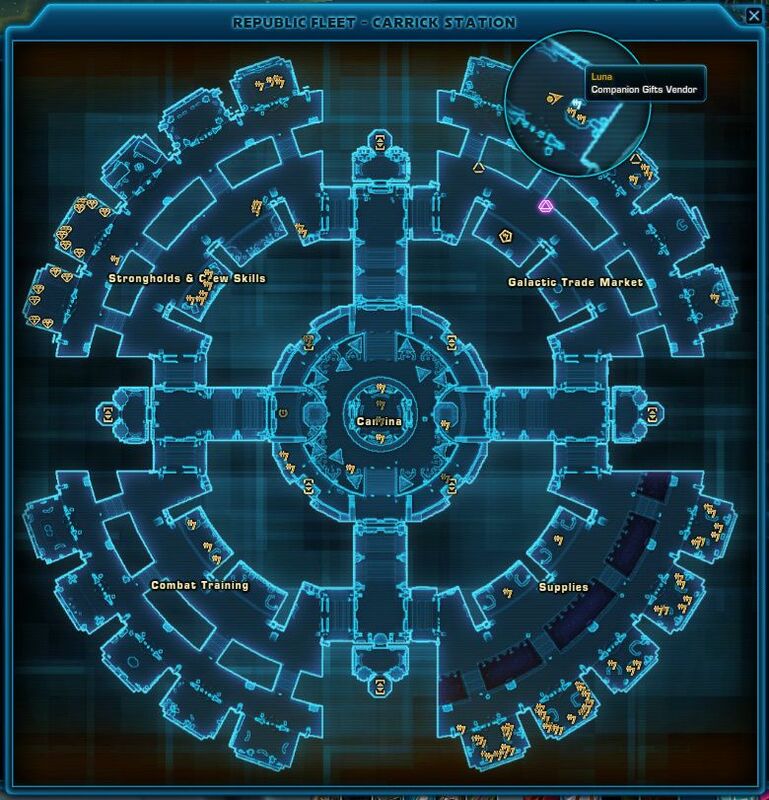 I hope this SWTOR Guide is useful to beginners out there. And if anyone spots any errors, or omitted options, please let me know. That way we can all serve the SWTOR Community better!